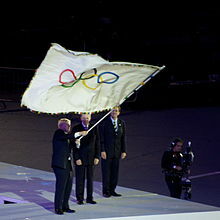 The Olympic flag at the closing ceremony of the 2012 Summer Olympics. France 1894 Athens selected as the host for the 1896 Summer Olympics. Paris selected as the host for the 1900 Summer Olympics. Greece 1896 Pierre de Coubertin elected President of the IOC. France 1901 St.Louis selected as the host for the 1904 Summer Olympics. United Kingdom 1904 London selected as the host for the 1908 Summer Olympics. Germany 1909 Stockholm selected as the host for the 1912 Summer Olympics. Sweden 1912 Berlin selected to host the 1916 Summer Olympics. All international Olympic business was suspended from 1915 to 1918 due to World War I.
Switzerland 1919 Antwerp selected to host the 1920 Summer Olympics. Switzerland 1921 Chamonix selected to host the 1924 Winter Olympics. Paris selected to host the 1924 Summer Olympics. Amsterdam selected to host the 1928 Summer Olympics. Italy 1923 Los Angeles selected to host the 1932 Summer Olympics. Czechoslovakia 1925 Henri de Baillet-Latour elected President of the IOC. Portugal 1926 St. Moritz selected to host the 1928 Winter Olympics. Switzerland 1929 Lake Placid selected to host the 1932 Winter Olympics. Spain 1931 Hosted few days after the Second Spanish Republic was proclaimed. Berlin selected to host the 1936 Summer Olympics. Austria 1933 Garmisch-Partenkirchen selected to host the 1936 Winter Olympics. Germany 1936 Tokyo selected to host the 1940 Summer Olympics. Poland 1937 Sapporo selected to host the 1940 Winter Olympics. United Kingdom 1939 Garmisch-Partenkirchen selected to host the 1940 Winter Olympics. Cortina d'Ampezzo selected to host the 1944 Winter Olympics. London selected to host the 1944 Summer Olympics. All international Olympic business was suspended from 1940 to 1945 due to World War II. Switzerland 1946 St. Moritz selected to host the 1948 Winter Olympics. London selected to host the 1948 Summer Olympics. J. Sigfrid Edström elected President of the IOC. Sweden 1947 Oslo selected to host the 1952 Winter Olympics. Helsinki selected to host the 1952 Summer Olympics. Italy 1949 Cortina d'Ampezzo selected to host the 1956 Winter Olympics. Melbourne selected to host the 1956 Summer Olympics. Finland 1952 Avery Brundage elected President of the IOC. France 1955 Squaw Valley selected to host the 1960 Winter Olympics. Rome selected to host the 1960 Summer Olympics. West Germany 1959 Innsbruck selected to host the 1964 Winter Olympics. Tokyo selected to host the 1964 Summer Olympics. Luge added to the program in 1964. West Germany 1963 Mexico City selected to host the 1968 Summer Olympics. Austria 1964 Grenoble selected to host the 1968 Winter Olympics. Italy 1966 Sapporo selected to host the 1972 Winter Olympics. Munich selected to host the 1972 Summer Olympics. Netherlands 1970 Denver selected to host the 1976 Winter Olympics. Montreal selected to host the 1976 Summer Olympics. West Germany 1972 Lord Killanin elected President of the IOC. Austria 1974 Lake Placid selected to host the 1980 Winter Olympics. Moscow selected to host the 1980 Summer Olympics. Greece 1978 Sarajevo selected to host the 1984 Winter Olympics. Los Angeles selected to host the 1984 Summer Olympics. Soviet Union 1980 Juan Antonio Samaranch elected President of the IOC. West Germany 1981 Calgary selected to host the 1988 Winter Olympics. Seoul selected to host the 1988 Summer Olympics. Tennis readmitted to the Olympic program in 1988. Switzerland 1986 Barcelona selected to host the 1992 Summer Olympics. Albertville selected to host the 1992 Winter Olympics. Changed on separating Summer and Winter games in alternating even-years beginning from 1994. Puerto Rico 1989 Demonstration sports were removed from the Olympic program beginning from 1994. Japan 1990 Atlanta selected to host the 1996 Summer Olympics. United Kingdom 1991 Nagano selected to host the 1998 Winter Olympics. Curling and snowboarding added to the Olympic program in 1998. Monaco 1993 Sydney selected to host the 2000 Summer Olympics. Beach Volleyball added to the Olympic program in 1996. Hungary 1995 Salt Lake City selected to host the 2002 Winter Olympics. Switzerland 1997 Athens selected to host the 2004 Summer Olympics. Russia 2001 Beijing selected to host the 2008 Summer Olympics. Jacques Rogge elected President of the IOC. Czech Republic 2003 Vancouver selected to host the 2010 Winter Olympics. Singapore 2005 London selected to host the 2012 Summer Olympics. Baseball and softball removed from the Olympic program in 2012. Guatemala 2007 Sochi selected to host the 2014 Winter Olympics. Creation of the Youth Olympics. Singapore selected to host the 2010 Summer Youth Olympics. Denmark 2009 Rio de Janeiro selected to host the 2016 Summer Olympics. Golf and rugby readmitted to the Olympic program in 2016. Jacques Rogge re-elected as IOC President. Canada 2010 Nanjing selected to host the 2014 Summer Youth Olympics. South Africa 2011 Pyeongchang selected to host the 2018 Winter Olympics. Argentina 2013 Tokyo selected to host the 2020 Summer Olympics. Wrestling selected for Olympic program for 2020 and 2024. Thomas Bach elected to succeed Jacques Rogge as IOC President. Russia 2014 Discussions on ideas that will eventually form a strategic roadmap for the future of the Olympic Movement, the so-called Olympic Agenda 2020 initiated by IOC President Thomas Bach last year. Monaco 2014 Extraordinary session hosted by IOC member Albert II, Prince of Monaco. The IOC discussed IOC President Thomas Bach's "Olympic Agenda 2020." Malaysia 2015 Beijing selected to host the 2022 Winter Olympics. Lausanne selected to host the 2020 Winter Youth Olympics. Brazil 2016 5 new sports for the 2020 Summer Olympics in Tokyo were approved. Switzerland 2017 Joint-awarding of 2024 and 2028 Summer Olympics approved. Bidding process for 2026 Winter Olympics approved. Peru 2017 Paris selected to host the 2024 Summer Olympics. Los Angeles selected to host the 2028 Summer Olympics. South Korea 2018 Reverted the date of the 2022 Summer Youth Olympics back from 2023, suggested an African city should be host. Argentina 2018 Dakar selected to host the 2022 Summer Youth Olympics. Switzerland 2019 Milan-Cortina d'Ampezzo or Stockholm-Åre to be selected to host the 2026 Winter Olympics. Switzerland 2020 The selection to host the 2024 Winter Youth Olympics. 147th TBD TBD 2029 Election of host city of 2036 Summer Olympics. ^ a b c d e f g h i j k l m n o p q r s t u v w x y z aa ab "IOC VOTE HISTORY". www.aldaver.com. ^ a b c d "Sessions du Comité international olympique" (PDF). Olympic Review. International Olympic Committee. 26: 2. March 1951. Retrieved 2010-02-04. ^ Comité International Olympique (September 1959). "Extract of the minutes of the 47th session — Helsinki 1952 (Palais de la Noblesse" (PDF). Bulletin du Comité International Olympique (34–35): 22. Retrieved 2007-07-19. ^ a b "IOC Congresses and sessions" (PDF). Olympic Review. International Olympic Committee. 188: 428. 1983. Retrieved 2010-02-04. ^ a b c d e f g h i "Olympic News - Official Source of Olympic News". Olympic.org. 4 May 2017. Retrieved 2017-05-04. ^ "Chronological Highlights". Fédération Internationale de Volleyball. ^ "Media Resources". Olympic.org. 4 May 2017. Retrieved 2017-05-04. ^ "Five new sports voted onto Tokyo 2020 Olympic programme". Insidethegames.biz. Retrieved 2017-05-04. ^ "132nd International Olympic Committee Session: Day two". Insidethegames.biz. Retrieved 2018-02-12. ^ "IOC targets African cities to host 2022 Youth Olympics". Independent Online. Retrieved 2018-02-12. ^ Livingstone, Robert (20 September 2018). "Lausanne To Host Vote For Winning 2026 Winter Olympic Bid Instead of Milan After Italy Enters Race". GamesBids.com. Retrieved 21 September 2018. ^ "Athens targeted to host 2021 International Olympic Committee Session". insidethegames.biz. Retrieved 28 March 2019.